Victor Hugo once proclaimed, “Dear God! How beauty varies in nature and art. In a woman the flesh must be like marble; in a statue the marble must be like flesh.” He might as well have been talking about hyperrealistic sculpture. Hyperrealistic sculpture is the meticulous art form which captures the complex human aesthetic so perfectly that the figures could almost be alive and breathing. Using mostly clay, resin and silicone, hyperrealist sculptors make 3-dimensional models and paint every feature, from the sags and curves of the skin to each dandruff-laden follicle. No detail is neglected. These sculptures can take months to finish and it’s not hard to see why. They are impossibly realistic and have tapped into our natural curiosity about our own shells, our fascination with wrinkles, folds, greasy pores and the different shapes and sizes of the human body. But why do so many of us find this work both fascinating and revolting? Ultimately, hyperrealism showcases what the human body is actually like, highlighting how unappealing we often find the reality of the human form. Not only do these sculptures allow us to interrogate physical reality, but they also catch us off guard and make us question our visual perceptions. Here are eight hyperrealist sculptors who demonstrate the art form at its best. Not only can we appreciate the painstaking craftsmanship that’s gone into this work, but each artist tells a different story, and raises the issue of our narrow aesthetic ideals and constant quest for physical perfection. But beware, these artists are akin to Dr. Frankenstein, and their work is not for the squeamish. 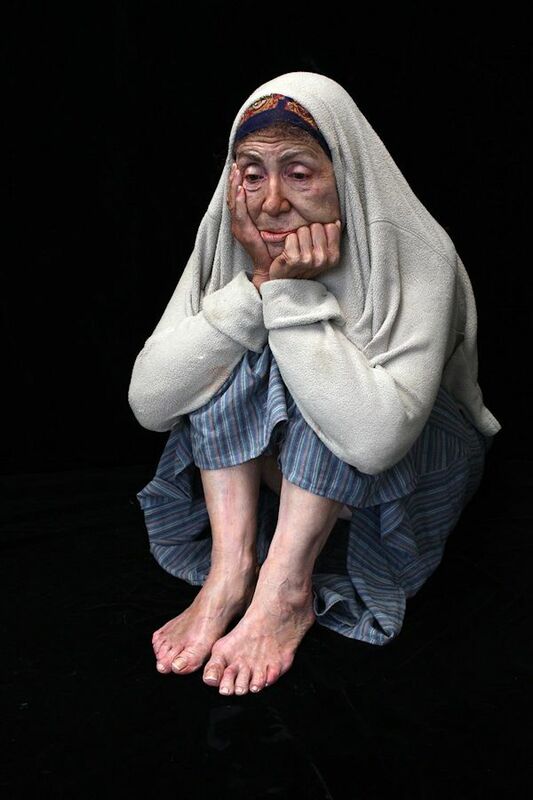 Marc Sijan‘s work captures the intensity of raw human emotion in lifelike figures. His work evokes empathy, depicting people that you might see in real-life situations, and this makes his sculptures all the more intriguing. Xooang Choi darkly distorts the human body, evoking questions over gender and identity and challenging us to think about the boundaries of the human form. One of Sarah Sitkin‘s most interesting projects is a phone case made to look like a healthy human ear. It yields to touch the way a natural ear would and has the same texture. The work highlights the fact that technology is becoming nearly as essential to our lives as our organs and senses. In the future, when we may be able to design our bodies, what design choices will we make? The melancholic figures in Jackie K. Seo‘s sculptures are naked and vulnerable as they seem to ponder the human condition. This artistic duo of Sun Yuan and Peng Yu is known for using unconventional materials in their work, including human fat. You may have seen their fallen angel statue, which riled emotions when it was publicly exhibited in Beijing. Jamie Salmon‘s giant statutes contain real human hair. They’re also surprisingly human despite their massive scale, reminding us that each of us faces our own obstacles. With his hybrid lumps of flesh, Felix Deac‘s work challenges how comfortable we are with objects that look like they’re made out of human skin. His work invokes our fear of aesthetically humanoid but entirely unknown creations. Trent Taft creates imaginary characters using human features. These heads look as though they could have rolled off the set of a horror film.